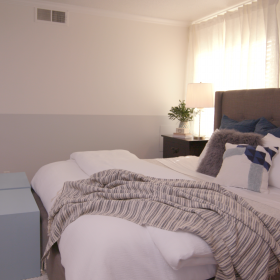 For this project we used our KILZ COMPLETE COAT® Paint and Primer in One in neutral based colors to transform this plain master bedroom wall into the perfect statement. 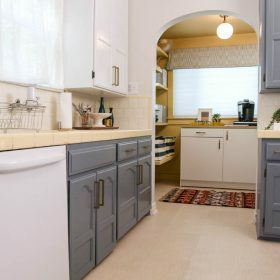 Although we chose more muted colors for this specific space, you could always go bolder, repeating more (or less) of the stencil patterns to accomplish a louder more extroverted look. 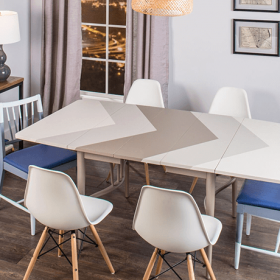 The great news is that the stencils come in all types of styles leaving the opportunities virtually endless when it comes to which type of look you want to create. Mix and match! Using the stencil patterns behind or above furniture pieces is a nice way to really make them feel custom to the room. 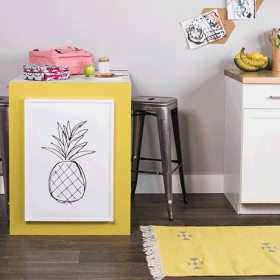 You could also pull stencils in order to frame artwork or simply add extra dimensions to your décor. The color of the stencil here subtly pulls from other colors in the room. In this case, the tone of the stencil ties in with the bedding and comforter set. We could have also opted for an orange tone to really make the accent pillows pop. This could be a nice effect in a living room space, or even in a dining room above a serving unit. This project is simple! 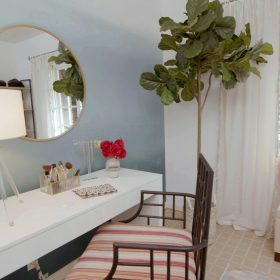 See below for a full tutorial about how you can achieve this look in your space. Loving it? 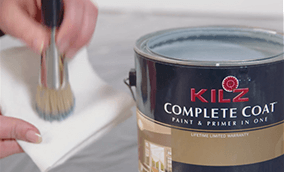 Explore our full KILZ COMPLETE COAT® palette here. 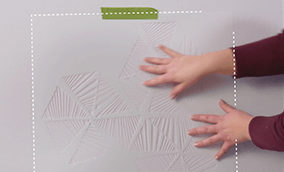 Determine location of pattern to be stenciled on wall. Stir paint to make sure it is mixed. Spray stencil with adhesive or secure stencil with painters tape. Level and then secure your stencil on the top middle of the wall with painter’s tape. Make sure the stencil is secure before you add paint. Stencil the pattern by lightly dabbing the paint until the areas are fully covered. Load your brush with paint and off-load most of the paint onto a paper towel. 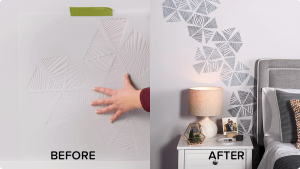 Using too much paint when stenciling is the number one reason for bleeding, so make sure to off-load excess paint before starting on the wall. Move on to the second repeat of the pattern by following the registrations that are included in the stencil. These registration marks help you move and place the stencil along the wall perfectly every time! Allow 2 hours dry time. Then call your best friend and invite them over for coffee because you’re all done.